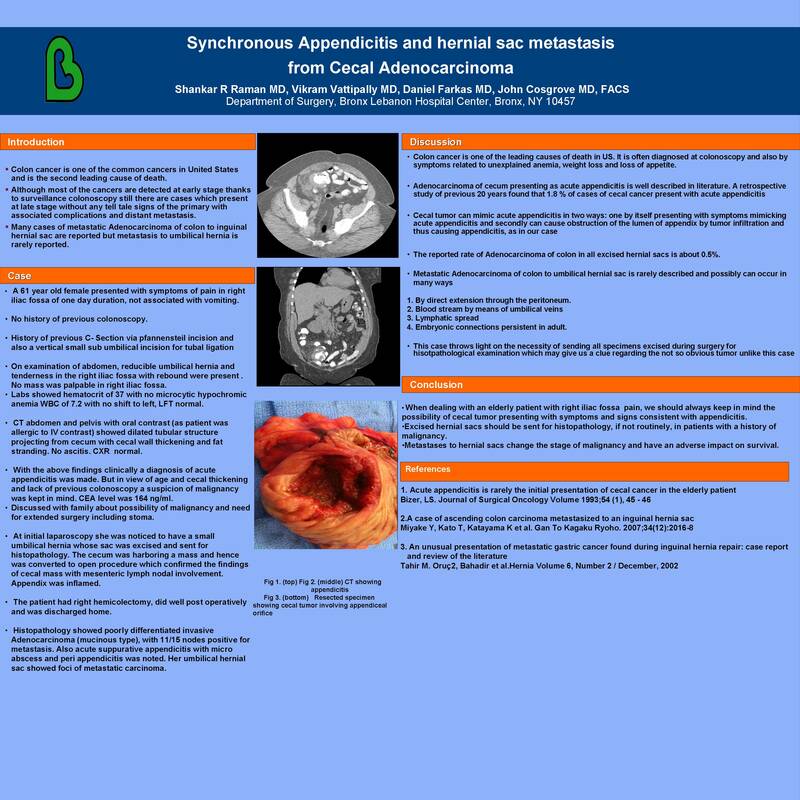 Introduction: Cecal adenocarcinoma presenting as appendicitis , although rare is not unknown. The association of the two with umbilical hernial metastasis has not been reported before. Methods:A 61 year old lady presented with one day history of right lower quadrant pain. On exam, she had tenderness in the right iliac fossa and also an umbilical hernia. Appendicitis was confirmed on CT scan. Diagnostic laparoscopy showed a large cecal tumor and the patient underwent a right hemicolectomy. Results: Adenocarcinoma of the cecum was confirmed on pathology along with appendicitis and metastasis to appendix. Also, the umbilical hernial sac showed a focus of metastatic adenocarcinoma. Conclusion:This case highlights the importance of examining hernial sacs in patients with suspected malignancy. Awareness of synchronous occurrence of appendicitis and cecal carcinoma helps in appropriate pre-operative and post-operative management.